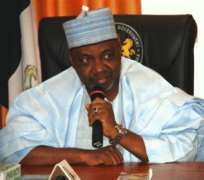 Vice President Namadi Sambo is to lead a 60-man National Campaign Council of the Peoples Democratic Party (PDP) for the November 16 governorship election in Anambra State. The team which is constituted by National Working Committee (NWC) of the party has Victor Kwon, the party's National Legal Adviser, as its Secretary. The campaign council will be inaugurated today at the National Secretariat of the party. A statement by National Publicity Secretary of the PDP, Olisa Metuh, said the committee is expected to work round the clock to ensure the victory of the party in the election. The statement called on all members of the PDP to close ranks and support the party's candidate, Tony Nwoye. Another report said National Chairman of the PDP, Bamanga Tukur, has directed the party leadership at the zonal, states, local government areas and wards to establish disciplinary committees in accordance with Section 57(1) (2) of the constitution of the party. The committees are to comply with the provisions of the PDP constitution and the principles of equity and fair hearing in dealing with all disciplinary cases at their various levels. Also on Wednesday, the Independent National Electoral Commission (INEC) in compliance with the order of the Court of Appeal sitting in Port Harcourt re-listed Tony Nwoye as governorship candidate of the PDP for the Anambra poll. It would be recalled that the Appeal Court had also ordered that the judgment of the Federal High Court also sitting in Port Harcourt, delivered on September 17, which had ordered that Nicholas Chukwujekwu Ukachukwu be listed as the PDP candidate be set aside along with all the interim and interlocutory orders made there in. INEC has since complied with the order of the Court of Appeal and replaced the name of Ukachukwu with that of Nwoye on its website. The Court of Appeal sitting in Port Harcourt had on October 23 set aside the Federal High Court's ruling, affirming Ukachukwu as the PDP candidate.